Zaanse Schans consists of a row of old but still functioning windmills and green painted houses and barns along a river in the Dutch countryside. The historic village is free to visit and easy to reach. A day trip to Zaanse schans from Amsterdam is only about 40 minutes away by train or bus. A day trip to Zaanse Schans might be a little touristy perhaps, with its overdose of souvenir shops. But still, for half a day trip, Zaanse Schans is a charming and interesting place to visit from Amsterdam, also with children. Zaanse Schans is located just North of Amsterdam, along the river the Zaan, an area known as Zaanstreek. As it is near Amsterdam, a visit to Zaanse Schans ca best be combined with a visit to some of the other historical villages such as Volendam, Marken and in spring with a visit to the flower gardens of Keukenhof. The Zaanse Schans is free to visit. There are 7 windmills, some of which ask an entrance fee of €4,-. The shops are free to enter. Some museums also ask for a fee. A bus tour takes you to Zaanse Schans and the fishermen’s villages f Marken and Volendam. 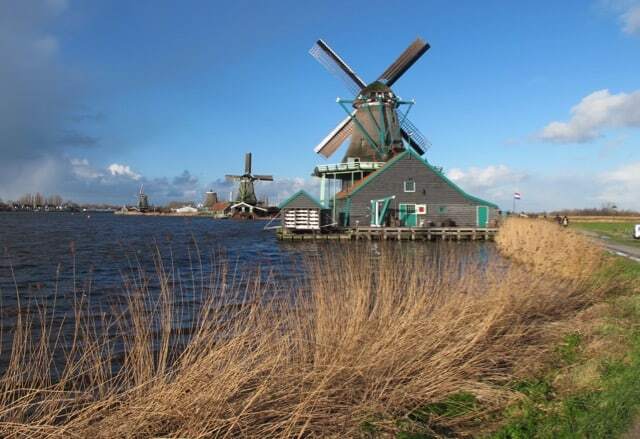 You will visit the windmillls, a cheese farm, a clogmaker, taste Dutch cheese, stops at Zaanse Schans and the fishermen’s villages of Marken en Volendam. The name Schans refers to a defence works the Dutch had set up in the area to fight off the Spanish during the 80-year war. The battle and the Zaanse victory of 1574 is memorized every year with a reenactment. The Zaanstreek is often named as the world’s first industrialized area. In the 17th century some 1000 wind mills stood along the river to make flour (for bread) and cacoa (for chocolate), saw wood, crushing seeds to make oil, grinding spices and grinding colored wood to fabricate paint. Towards 1850, steam engines took over wind mills’ job. Around 1920 only some 20 wind mills remained along the river, unused. To save the last Dutch wind mills in this area, 13 mills were moved and saved, along with houses and barns to create the new Zaanse Schans. Het open air museum of Zaanse Schans is now a tourist attraction in Holland. 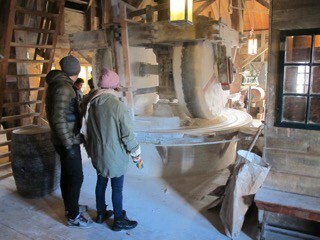 Millstones in action at wind mill De Kat, Zaanse Schans, grinding limestone. Nowadays you can take a look inside the fully functioning wind mills of Zaanse Schans, like De Kat (The Cat), probably the last paint wind mill in the world. It’s quite impressive to walk around inside and outside the wind mill and see the wooden parts and millstones grind. The millstones grind colored wood to obtain powders that can be used to make paint by adding oil of egg. The paint is for sale at the mill, along with some 1000 pretty useless souvenirs which are cheaper in Amsterdam. Apart from wind mills, there are also many craft shops to be visited. Several Dutch crafts are demonstrated, from wood working to cheese making and bread baking. At the Dutch cheese shop you can taste the many cheeses with a large variety of excellent mustards. The cheeses are all young cheeses. If you want to buy a cheese with a strong taste, it’s best to go to a real cheese shop in the city or supermarket and get a boerenkaas or oude kaas, which have stronger taste than these young cheeses. 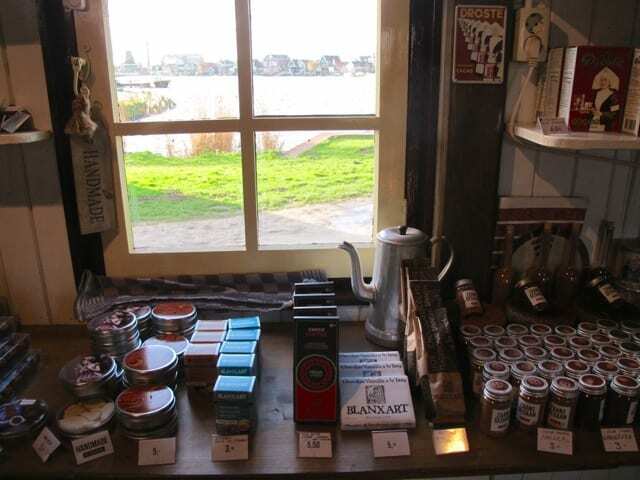 Chocolate shop at Zaanse Schans. At the small but charmingly decorated chocolate shop you can grind your own chocolate and prepare your own chocolate drink. There is also a liqueur distillery, a barrel maker and a wooden shoes workshop where you can make your own Dutch clogs. The strong smell of chocolate in the air sends out a signal: that the Zaanstreek still is a highly industrialized area and chocolate is still in the making every day. The well known supermarket Dutch Albert Heijn originated rom this area, as well as the famous Dutch chocolate brand Verkade. A day trip to Zaanse Schans from Amsterdam can be made by bus, train, car or bicycle. From Amsterdam you can also take a train to Koog-Zaandijk. The train takes you there in 17 minutes. From there it’s another 15 minute walk. It’s really easy to get to Zaanse Schans by car from Amsterdam. Just take the ring A10, direction North. Continue on A8 and follow signs for Leeuwarden/Purmerend/Zaanstad. Take exit 2 (direction Zaandijk). From there you can follow the sigs to Zaanse Schans. Depending where you are in Amsterdam, it should take you about 30 minutes. Parking costs in 2015 € 9 for a day ticket. Sporty types can also bike to Zaanse Schans. It’s about 17 kilometres, so it should take you a little over an hour to get there.